Home » Brooms » It’s (almost) Showtime! The last week’s been a noisy blur. 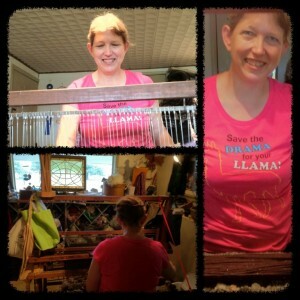 … and if I complain, she just smiles and points to the T-Shirt. 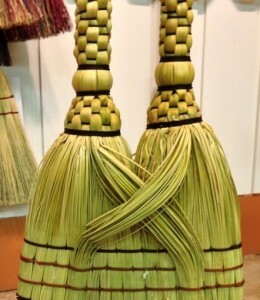 Meanwhile, Lena and I have been busy in the broom shop. There are now more brooms in that wee building that I have ever seen before. More styles of brooms, too, as we not only make all the styles we normally make, but a few new ones just cause we can and to see what the public thinks. In the evening, while Jeanette spins, I’ve been putting the finishing touches on this website, new banners for the booth, new business cards for Jeanette, and, on occasion, sleeping. But the time for prep is over. Tomorrow, we pack and load and drive and unload and unpack and set up and wait. Maybe we’ll sleep, too. Then, Friday, December 7 from 10 am to 8 pm, and Saturday, December 8 from 8 am to 6 pm, and Sunday, December 9 from 10 am to 4 pm Jeanette and I will be at the Statehouse Convention Center in downtown Little Rock, Arkansas participating in what some call Arkansas’ Premier Arts and Crafts Event (I call it the Nation’s Premier Arts and Crafts Event), Arkansas Craft Guild’s 34th Annual Christmas Showcase. Here’s hoping you come on down and see us!